It’s finally the day we’ve been counting down to for the past 5 months. No, not Christmas. It’s October 8th, 2014. The first day of the 2014-15 NHL Regular Season. There are four games featured tonight, and there are some to be some intense and wild ones. 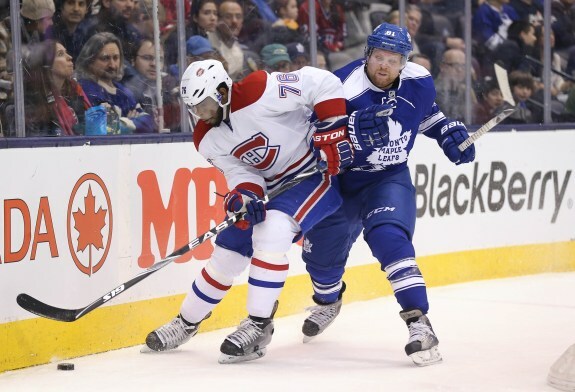 The Toronto Maple Leafs host the Montreal Canadiens at 7:00PM EST, a long time rivalry in which the teams seem to begin each and every season against each other. The Philadelphia Flyers will fly to Boston for a 7:30PM EST matinee. The Boston Bruins are the defending President’s Trophy winners and will look to keep their form. The Calgary Flames will play host to the new-look Vancouver Canucks at 10:00PM EST. Remember last year’s game which had 158PIM within the first two seconds of the game? Yea. Also at 10:00PM EST, The defending Stanley Cup champions will raise the banner in front of who else but the San Jose Sharks, the team they erased a 3-0 deficit against last Spring. Long-time rivals since the league was created, it is well-known that the Toronto Maple Leafs and Montreal Canadiens hate each other. In fact, this past summer, Josh Gorges declined a trade to Toronto for the fact that he hates them too much. In last year’s season series, Montreal took three games out of five. No matter how good or bad each team is, it’s always a physical, intense and close game. This season, it looks like Montreal may have the upper hand in the standings. As for tonight, I expect the same result. Toronto lost much of its depth this offseason and now feature a much younger and quicker team, with Orr and McLaren gone, and Komarov back in. Montreal has possibly the best goaltender in the world in Carey Price, and also 2012-13 Norris Trophy winner, PK Subban. I see Van Riemsdyk and rookie Josh Leivo scoring for Toronto. While Pacioretty, Gallagher, and Eller will tally for the Habs. These are two teams who often pride themselves on their physical style. Don’t expect anything different tonight. Boston is no doubt the favourite for this game, backstopped by last year’s Vezina Trophy winner, Tuukka Rask. The Bruins won all three contests between the teams in 2013-14. Philadelphia is led by Claude Giroux, who will need to take the team on his back if they expect another playoff position this year. I expect this game to go as expected, mainly because Boston has one of the deepest teams in the league, while Philadelphia features a team with a very young bottom two lines. On defence, there are paying way too much for a rather average lineup. Steve Mason is their backstop, and he had an up year last year. Unfortuanetly for them, Boston is far better and will prevail in their first game of 2014-15. Voracek will score for the Flyers, while Lucic, Krug, and Reilly (twice) will put up goals for Boston. It’s no secret these west coast teams hate each other after just two seconds of a game last year. While Hartley lined up his three enforcers at the opening face-off, Torterella responded by putting Bieksa as his centre. There were 158 PIM in those two seconds and Torts was suspended 15 days for trying to go into the Flames dressing room. Both teams have new looks this season however, with Ryan Miller and Jonas Hiller backstopping the Canucks and Flames, respectively. While Vancouver’s changes turned them into a possible playoff team, Calgary is still expected to be a bottom feeder in the tough Western Conference. Vancouver got rid of Kesler and added Bonino and Vrbata. Calgary got Diaz, Raymond, and Setoguchi, while they also drafted Sam Bennett 4th overall, and made the team. Calgary is too young and straight up bad to score of Miller, who will prove himself again. For Vancouver, Bonino, Edler, and Hansen will score. Probably the best game of the first day of the 2014-15 season sees defending Stanley Cup champs host the confused Sharks. No doubt, every players has round one fresh in their mind for tonight. In case you forgot somehow, San Jose took a commanding 3-0 series lead and were looking like Cup favourites until they imploded and lost the series 4-3, while LA went on to hoist the Cup. The Sharks come into this season with a very young bottom two lines, possibly featuring an all rookie line. While there have been rumours Joe Thornton may centre the fourth line. Even their starter is up in the air. Meanwhile, in Los Angeles, its the exact same team, minus Willie Mitchell. There’s no doubt most will favourite L.A. to win this game, but I could see the determined San Jose Sharks pull off an upset. The Sharks seem to start every year well, it’ll be no different in 2014-15. Nieto, Pavelski, and Wingels will score for the Sharks, while for the Kings, it’ll be Lewis and Toffoli on pace for 82 goals after one game. Prediction: San Jose wins 3-2. It’s guaranteed to be a great night when hockey is on, but tonight is extra special. Gather around, grab some good friends and good food and enjoy the great game on ice. And remember, it’s only the first night of the next 172, of nights of hockey. Good luck to all! Feel free to share your predictions for the games tonight!